Playing a key role in the transformation of the Indian economy, the IT industry has been one of the fastest growing in the country and has successfully managed to build brand equity that is valued globally. This field is witnessing revolution on a rapid pace and it has changed the shape of the sector in terms of Indian business standards. And a part of this revolution is RAH Infotech, established in 2005, the brainchild of Ashok Kumar, Founder, and Managing Director. Today it is recognized as the Fastest Growing Value-added distributor in India. Their solutions are tested, renowned, reputed, recognized and awarded names in the Industry in fields like infrastructure, networking, wireless technology, cloud computing, virtualization and more. Ashok Kumar is our founder and Managing Director. The success story of RAH Infotech is synonymous with him as an individual. It is his vision for this company that drives every individual within this organization. His relentless work and his undying passion to work with the best and deliver the best in the industry is an inspiration for all – those who work with him within the organization and those who get to work with him from the outside. They have managed to channel their focus on approaching and encouraging partnering selective OEM’s in networking and security they ensure that the business has a defined goal and growth plan. RAH Infotech takes their recognition as the leading Value Added Distributor very seriously and thus follows a handcrafted tactic to working as a team with the OEM’s, Resellers and Customers. Ashis: RAH Infotech as a company is very selective about the products we represent. We work closely with products we believe are here to make a positive difference in the world of information technology. As a value-added distributor, although all our sales are indirect and only through partners, we take an active part at all levels of sales and presales to help bring key deals to closure. Our engagement in this depth for deals is what ranks us over other competitors. Ashis: We serve 3 categories of Clientele namely our OEM, our Partner, and our Customer. We engage in a deal at all levels and support through the successful closure of the same. We are truly honored to have the support of OEM’s such as Radware, Forescout, Gemalto, Skybox, Rapid7, Cambium Networks, Quest and many more who continue to work with us as their preferred distributor in India and APAC. Our presence infact is across multiple domains such as: Government, PSU’s, BFSI, Telecom, IT/ITES, Manufacturing and many more. Ashis: Our core values are the driving force of this organization. We practice and promote Trust, Efficiency, Commitment, Teamwork, and Reliability within and outside the organization. Our dedication is 100% Direct but all our sales are 100% Indirect. Ashis: We understand the pulse of the market trends and work towards developing our strengths in the same. We also work very closely with market consultants, analysts and our customers to have an in-depth understanding of technologies and requirements of the future. One can also see our presence across various global summits which gives us the opportunity to meet various leaders in the industry and have insightful discussions on the future of IT. Business Connect: In terms of Information Technology, what do you feel the future holds for entrepreneurs? Ashis: Over the last 5 years, India has witnessed exponential growth and development in the field of Information Technology. Government schemes such as “Make in India” and “Digital India” has put India on the Global map of IT again. For some new gen businesses and we all know what I’m talking about, their presence in the market is through their IT outfit. Which means IT is not just an ‘enabler’ for them, it is the heart of their core business. Various e-Commerce, e-Auction, social media houses are a living example of this and look at how they have grown in the last decade or even less. 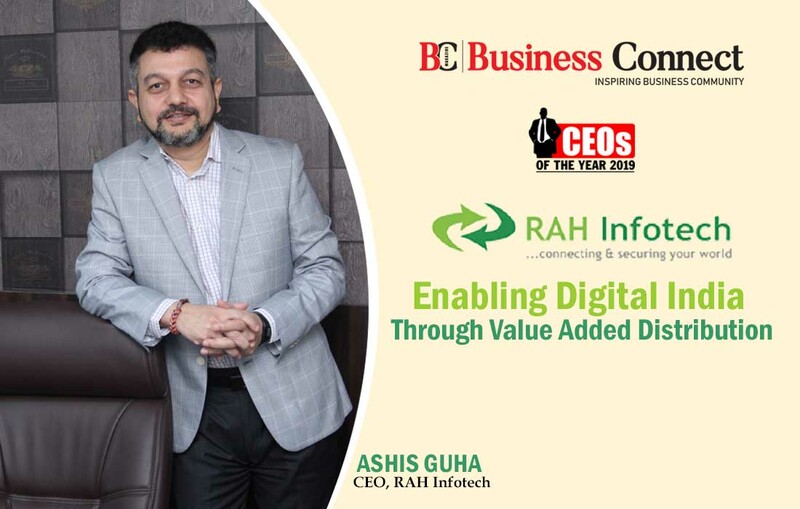 Ashis: The foundation of RAH Infotech is built on our “4 Pillars” of strength, namely our Technology Partners, our channel Partners, our Customers, and our People. Employees are the heart of every organization and Happy Employees make for a healthy heartbeat. As an organization we have also been strong promoters of gender diversity – RAH Infotech takes pride in the women who have been our driving force for all these years. Be it sales, administration or leadership, we encourage women to work with us and support them through their years of service. Our endeavor is to keep our employees Happy, Content and Connected through various HR initiatives through the year. We conduct events, celebrate festivals together, have training programs and team building activities to ensure our Team stays motivated and encouraged. Ashis: I have had a long career and I have had many role models at different stages of my life. I have looked up to the people I have worked for, my bosses, my leaders, and my colleagues. The foundation of my life I owe to my parents. My parents are my role models and they have both been supportive in my life and decisions I made, which has brought me here today. In the world of business, I continue to look up to Mr. Bhaskar Pramanik. I was lucky to have an opportunity to work with him when in Sun Microsystems. Anyone who has worked with Bhaskar will tell you what a great leader he is and how his leadership played a big role in shaping us all into the leaders we are today. Ashis: With work full swing I now prefer to use my free time with my family and friends. My wife has been a great source of positivity for me and she has been extremely supportive through my journey of working long hours and travel. Despite having a career she managed home and family beautifully and I thus now ensure I take time out from my schedule to give her my undivided attention whenever I can. She is indeed my emotional anchor and any time spent with her is time cherished. I have been a sports person most of my life. Till about a few years ago my weekends were dedicated to playing a game of cricket. My weekends these days are spent catching up with soccer matches on television. Ashis: The government has taken some incredible initiatives such as “Make in India”, “E-Governance” and “Digital India” which has opened up many closed doors for many companies and partners. Under the “Pradhan Mantri Jan Dhan Yojna” over 31 crore bank accounts were opened in India – which also means that these banks had to up their IT Infrastructure and Security to protect the same. RAH Infotech has recorded a consistent growth year on year and wishes to build and grow further. Presently they are at the cusp of growth and expect to take a giant leap forward. With India soon heading to be among the top 5 economies in the world, RAH Infotech is geared up to support this growth and benefit from the same. They look forward to continuing to work closely with the Government of India and other entities across different verticals in the security, infrastructure and network space encouraging the use of right technology.